A Denver court recently decided that the U.S. Fish & Wildlife Service would have to reconsider placing Graham’s Penstemon—a small purple wildflower that grows on the oil-shale fields of the Uintah Basin—on the Federal Endangered Species List. For environmentalists as well as oil and gas developers, the court case has been closely watched, as federal protection for the flower easily could spell extinction for oil-shale development plans in the area. How it was that the agency could not have foreseen the perfect storm threatening to eliminate the small flower that grows on the harsh lands of the basin is a matter of differing opinion. In 2006, FWS responded to a petition to consider the flower as a candidate for protection and was given the go-ahead for a yearlong study to make a final recommendation. According to environmentalists, FWS was bombarded that year by the federal Bureau of Land Management with pressure to squash the plant’s chances of being listed. Records obtained by Earth Justice, the counsel for plaintiffs the Utah Native Plant Center, the Southern Utah Wilderness Alliance and other parties suing the Interior department in the case, discovered that some BLM field offices in Vernal had a Penstemon “Strikeforce” team, determined to present all evidence necessary to make sure the wildflower would not get in the way of energy development in the Basin. In May 2010, at the University of Utah Unconventional Fuels Conference, oil-shale companies tentatively announced that the technology to develop oil shale was ready to launch. 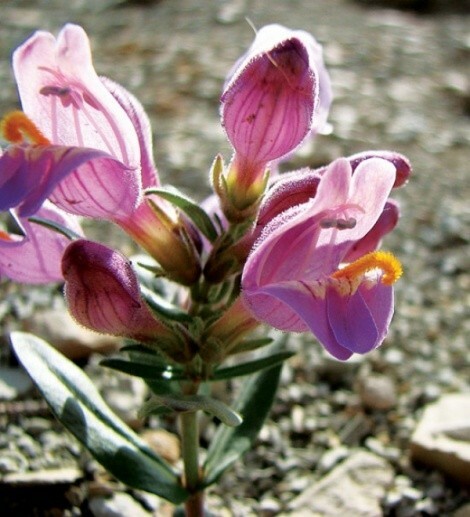 One Utah company expects to build a mine in the basin in 2012 and hopes to produce oil from the rock by 2014, assuming they receive the necessary permits—and Graham’s Penstemon doesn’t get in the way. When it comes to oil-shale development and endangered-species protection, the argument is about where the Penstemon sinks its roots—right on the surface of the basin’s oil-shale fields. FWS Branch Manager Bekee Hotze says that, quite simply, oil-shale development and the flower don’t mix—at least, “not on the same piece of dirt, they don’t.” Since the flower is endemic to the region and prospective oil-shale development would require a type of surface-level strip mining, the flower species would not survive on surfaces where development is planned. Hotze says her agency acknowledges there were a lot of factors at play in 2006, the first time they deliberated the flower’s fate. One factor that weighed against giving the plant protected status was a conservation agreement that had been crafted between the BLM and state and county agencies and other parties meant to protect the plant species. She also says her agency did not consider oil shale as a legitimate technology at the time and also did not realize how contiguous the flower population was across the basin. Hotze does acknowledge that politics were part of the equation, though. She notes with disappointment that the BLM added to the chorus of voices saying that substantive oil-shale technological developments were unpredictable and shouldn’t weigh in favor of the flower’s being listed for protection. Then, after FWS removed the flower as a candidate for protection, the BLM published an environmental-impact study laying groundwork for oil-shale development in the basin. “That didn’t help, either,” Hotze says. In 2007, however, a crucial change occured: Former FWS Deputy Assistant Secretary Julie MacDonald resigned after an investigation discovered she had interfered in designations to the Endangered Species Act, with allegations of her even reversing scientific findings to defeat species protection. “Ever since [she resigned], there has been a concerted effort to base all our decisions on science,” Hotze says. Others are still not so optimistic. Tony Frates of the Utah Native Plant Society notes that a recent lawsuit was joined by environmental advocates of WildEarth Guardians to protect another Penstemon species, Gibbon’s Penstemon, a rare flower that grows in areas of Wyoming as well as in isolated locations in Utah’s Daggett County. Similar to its cousin, Graham’s Penstemon, the Gibbon’s variety has also received initial assessments by FWS that say it could be endangered by energy development. While Denver Judge Walker’s decision has given Graham’s Penstemon a fighting chance, there’s still the issue of funding the final study. Currently, the FWS branch can’t do another study until there is sufficient funding to support a review of new surveys in the basin that need to be done since the last study period in 2006. Even with the small flower quaking in the shadow of new development, Parish, for one, is still celebrating. “It’s a great day for the Graham’s Penstemon,” Parish says. “And we are really optimistic that Fish and Wildlife are going to look at the science and do the right thing and list Graham’s Penstemon as threatened.” Parish hopes the decision will be made within the year.